I hope that I am not the only person that finds this idea completely ludicrous. Not only would you never be able to scientifically prove that a gene is related to faith, there are many ancient religions that do not believe in a higher power. And furthermore, if you believe in many deities, do you have multiple copies of this gene? The fact that a gene leads us to believe in a higher power is the interpretation that most of my peers have taken on this subject, but with a little reading I found that their interpretation was inaccurate. 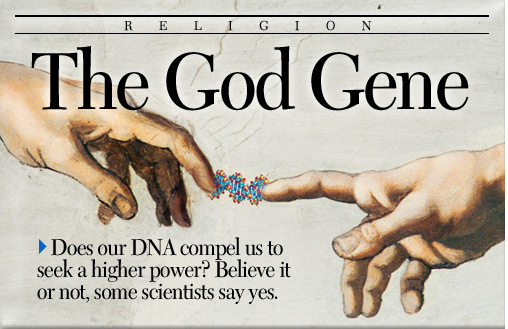 The “god gene” is actually thought to simply cause what is thought of as a religious revelation/experience. The gene is called VMAT2, and is expressly stated that it does not cause a belief in god. It does not even cause a “religious” revelation, but simple a set of feelings that is commonly interpreted as being spiritual. When you take this into account, it seems entirely possible that this gene could exist. That brings up the question then, if it does exist, what evolutionary purpose does it serve? It is a positive or negative selector? Or is it simply residual from a time before written word? My thought is that it is residual from before we had written or spoken word. To have a sense of being one with everything, or a spiritual feeling, would help primitive humans to form cohesive groups for survival. I personally am curious to see if other primates have this gene. If they do, I can see some people going nuts and trying to convert the monkey to their brand of self-centered religion. That would be something to see. This entry was posted in Hmmmm . . . and tagged god gene, monoamines, neurotransmitter, spiritual, VMAT2 on 2008-04-01 by Jill.